Double gourd Tarafdar Sitar of 13 taraf strings. Both side engraving works of Tabli and dandee, Rose leafs on the neck of the Sitar, Rose pegs fully decorated. 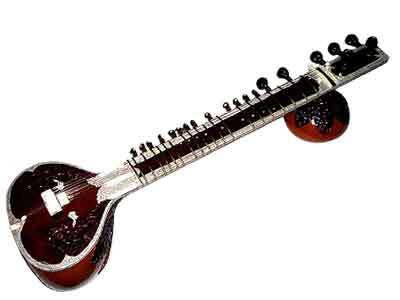 Double gourd Tarafdar Sitar of 13 taraf strings.